CALA proudly offers the following Continuing Education Opportunities (CECs). CALA Workshops, and Conferences are open to CALA members and non-members as well. you may now use them as credit towards TRO registration under the non-TRO-sponsored event category. less a $35+tax administration fee. CALA manuals are final sale and cannot be returned for a refund/credit. Assessment times are listed in the schedule above. Check out the other courses and workshops available through CALA. If the course or workshop you are looking for is not listed, please contact CALA. Consider hosting the event. Free document conversion site http://zamzar.com/ If you are unable to read docx documents, you can upload them to this site and they will convert for you at no charge. It just takes a few minutes. Finally the 'civilized' world is catching up with what ancient societies recognized the "Healing Power of Water" and practiced various forms of water exercise for centuries. Movement in water offers multidirectional resistance in a non impact environment. Water supports the body and cushions movement. When the water is warm enough, the pain cycle is interrupted and the healing process is encouraged. Aquatic Post Rehabilitation is not new. Recently, there has been renewed interest in water as a therapeutic means of healing. Health Care Providers, (physicians, chiropractors, physiotherapists, OT's, massage therapists - to name only a few) in the 'know' are referring patients to exercise in water. The business opportunities are immense. With certification in Healing Waters, you can expand your business, bring relief to so many people and contribute to the health and well being of your community: win-win-win. 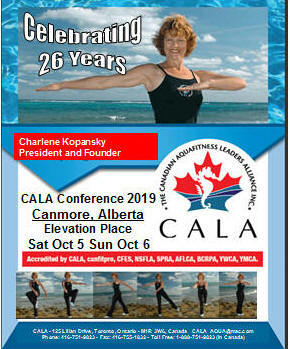 Charlene Kopansky, Founder and President of CALA Inc.